My 7 year old son Logan is wearing the costume. He came up with the idea and from limited pictures I could find on the internet I recreated the body, hands and feet on my own just by looks. All aspects of colors, flames and accessory pieces were all my own creations. No templates of any kind were used. Overall cost was right around $75. 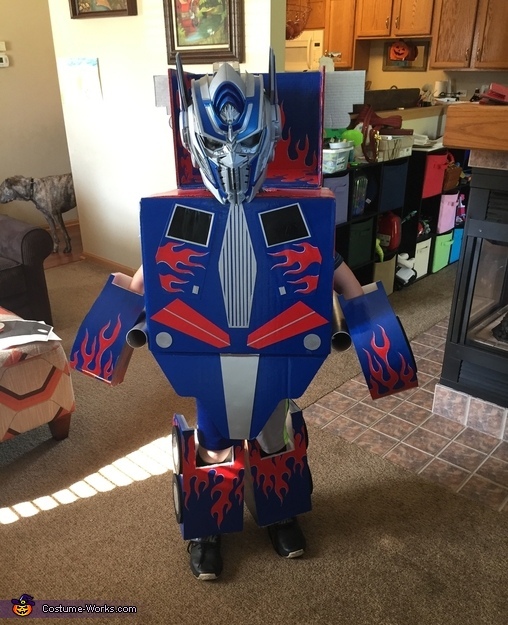 The helmet was bought and the size of the costume was designed around that but my son later decided he wanted everyone to know it's him and that this is his costume, so he abandoned that part. Had I known this would happen I might have went a little smaller in size. The supplies I used were 1/2 inch foam panels, cardboard boxes, shipping tubes, poster board, hot glue and a ton of paint. The hand/foot pieces were first drawn out, cut and constructed with the foam. They were later covered with painted poster board which was hot glued. The head and body were constructed from cardboard boxes. I then drew and hand painted everything that is red and blue. I was able to spray paint some of the accesory pieces such as the black windows, the wheels, the hubcaps, the grill and exhaust pipes. Many many many hours of hand painting went into this to make it right. 1 coat of primer and 4 coats of each color to be exact. I also added the small accents of bluish silver to the sides of each and every flame for detail. The hubcaps were drawn with a sharpie as they would have been too hard to paint. The grill is foam as well, covered and wrapped with silver poster board. I sprayed the foam backer black and cut 1/8 inch slits in the silver poster board so that the black would show through making for a more realistic looking grill. I also sprayed the headlight portion of the foam backer silver and cut out that portion of the poster board so the silver backing could show through as well for a more realistic look. The transformer emblem was 100% homemade on poster board and glued to the grill. I added marker lights cut from poster board and sprayed silver with added pieces of silver sprayed foam inserted into them. Exhaust pipes were made from shipping tubes, sprayed silver and bolted to main box for support. I used 4 carriage bolts with fender washers to support the flip back hood. I designed smaller doors, a representation of the grill design and a couple other small accent pieces to the front to be seen in transformer mode. All pieces are held on by Velcro and there is also a Velcro waist strap in the main body to hold everything in place. The reactions to this costume are priceless! You really see how much people appreciate a well done homemade costume! The best part, and the way you really know you did well, is the fact that not one single person has asked what he is supposed to be! Everyone knows right off the bat, that is Optimus Prime! This is the most work by far than I have ever put into a homemade costume and I could not be happier about the way that it turned out! Especially when you see the reaction on your child's face the first time they put it on! Nothing can top that! I would have loved to add more pictures because 3 just does not do this costume justice.